Are you excited for Record Store Day tomorrow? For most of you, it’s a wonderful day of wonderful instore gigs and celebration of music - hopefully in some blissful Spring sunshine too! But for a select few reading this, RSD means getting up at some ridiculous hour looking like you’re ready to go on an expedition to the Arctic to go queue in the pitch black in a constant state of anxiety, not even knowing if the rarefied record you need is even going to be there!! Trust us, we know ALL ABOUT IT! To those of you looking to get your hands on a special 7” or 12” this weekend, we wish you good luck and happy hunting! 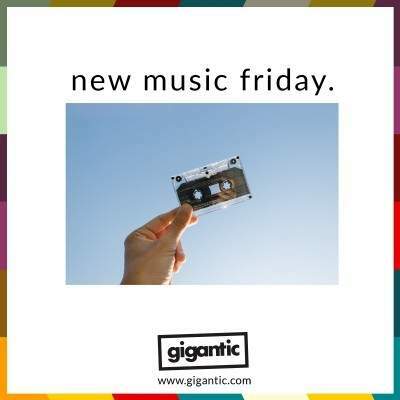 And for everyone, here is your #NewMusicFriday blog and playlist with all the hottest new tracks plus tickets to hear them performed live. It’s finally here!! After the seemingly endless wait, Irish post punks have just dropped their eagerly awaited debut album ‘Dogrel’. Having benefitted from a hell of a lot of airplay on BBC 6 Music after a attracting a widespread and dedicated following with their boisterous gigs, the anticipation for this first full-length record has been massive with the hype threatening to eclipse the results. Fortunately, the Dublin boys have not disappointed. ‘Dogrel’ is eleven tracks which refuse to stick to anyone one particular sound. It’s this eclectic nature which saves the album from expectation and becoming yet another one of these rough round the edges bands that everyone seems to label as ‘visceral’. ‘Too Real’ explodes in a whirlwind of energy and ‘Hurricane Laughter’ hurtles along whereas ‘Roy’s Tune’ and ‘Dublin City Sky’ are both wistfully melancholic. Real highlights come from thoughtful track ‘The Lotts’, ‘Chequeless Reckless’ which is brimming with confidence and stomping single ‘Big’. Fontaines D.C. tickets are currently available. It’s been nearly a quarter of a century since Tom Rowlands and Ed Simons brought rave from the warehouses and to the masses with their debut album ‘Exit Planet Dust’. Despite the years and the mileage, The Chemical Brothers show no signs of wear and tear on their ninth studio album ‘No Geography’. With their confidence at an all time high after their last LP ‘Born In The Echoes’ saw the pair nominated for Grammy, the dancemaster duo have returned to some old school rave on their album to remind us where it all began. Featuring the hypnotic track ‘Free Yourself’, disco infused ‘Got To Keep On’ and dirty club classic ‘We’ve Got To Try’, the singles sound as infectious as ever and are each accompanied with a such high quality promo vids they put a hell of a lot of SF films to shame! This summer sees them take over Victoria Park in London on Friday 24th of May for All Points East. The massive all dayer sees them joined by Hot Chip, Primal Scream, Spiritualized, Little Dragon, Danny Brown, Little Simz and Ibibio Sound Machine. Such a killer line up and you know you need to be there! The Chemical Brothers tickets are currently available. Embracing their inquisitive and experimental inclinations, Danish electronica outfit Lowly have shown marked improvement to their original record on their second LP ‘Hifalutin’. Though fraught with themes of anxiety and self-deprecation, the title means “pompous” or “larger than life” after all, the album is melodic and playful as synths dart and dance around upbeat melodies as guitarist and singer Nanna Schannong’s voice shines throughout. “We dared to be even more curious and started recording without knowing where we would end up. This curiosity released a huge amount of trust and confidence between us: we became much more tolerant of each other's diversity and dared to give each other space. It also meant that some sketches suddenly became two pieces… or, that eight to nine different pieces suddenly found themselves in one song." Lowly tickets are currently available. Following the release of their awesome debut album ‘Loner’ which came out two years ago, future bass dup MISSIO are back with their brash second LP ‘The Darker The Weather // The Better The Man’. Formed by producers Matthew Brue and David Butler in 2016, the pair quickly attracting a massive online presence and blew up at their debut performance at the SXSW festival in their Texan hometown of Austin. ‘The Darker The Weather // The Better The Man’ is essential listening and features the singles ‘Rad Drugz’ plus ‘I See You’ and is released on RCA Records. MISSIO tickets are currently available.